One of the major issues facing the modern medical care provider is making sure its IT provisions are up to scratch and suitable for the myriad applications they may be needed for. What happens, then, when your software vendor comes to you with the news that a number of the key pieces of software you rely on will no longer be supported? This was exactly the issue faced by Vanderbilt University Medical Center in 2015. The situation left VUMC with three options: 1. They could provide support for the software themselves; 2. Switch to a replacement the vendor had suggested; 3. Do something completely different altogether. Supporting software which isn’t developed in-house comes with inherent security risks, meaning option 1 was far from ideal. Option 2 was “safer” and seemed like the obvious choice – it wouldn’t take much work from the Vanderbilt Health IT team, and would mean little change in the way the Medical Center was operated. But what if Vanderbilt thought a little more outside-the-box and came up with a solution which really broke the mold, and would change everything about the way they operated at the Medical Center? Vanderbilt’s existing system was a complex mish-mash made up of over 500 separate pieces of software, which had been added to over the years as the varying needs of departments and practitioners had grown and changed. At its epicenter lay a bespoke patient record system named StarPanel – an in-house developed health record of all Vanderbilt’s patients. It was largely incompatible with systems being used by other medical institutions, posing problems for the transfer of patient data between them. New staff coming into Vanderbilt for the first time needed extensive training in its operation, with the inverse being true for Vanderbilt employees going to work at other institutions. It was therefore decided the time had come to push emotion and nostalgia aside and look for a complete software solution which would end the isolation imposed by StarPanel. “It was so important, as we were exploring our options, to really focus on solutions that would help us stay better connected to other institutions,” said Johnson. And so the team turned to the robust solutions offered by healthcare software company Epic Systems. Epic software is already either being used or will soon be implemented in 19 out of the 20 top hospitals in the US, and over half of American patients have their medical records held in an Epic-developed system. This made Epic a great fit for Vanderbilt’s IT overhaul plans. The initiative is being named “EpicLeap” to symbolize its forward momentum and paradigm-shifting nature. At its core will be eStar, an integrated system of 25 applications which will work together to cover every aspect of the IT challenges faced by a modern medical center – from health information exchange and infrastructure, to clinical operations and research. 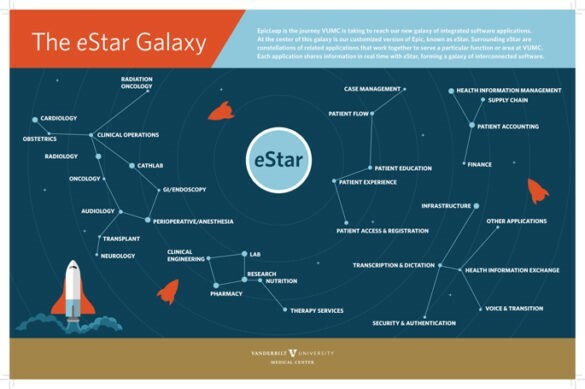 The transition to eStar (named as a nostalgic nod to the legacy of StarPanel) will also mean the entire patient experience will be streamlined and improved at every stage of the medical care journey. Where before, patient data was entered and stored on many different systems – dependent upon which department patients were being treated in – now everything will be entered and stored on eStar, regardless of department, meaning less paperwork for staff, and less hanging-around for patients. Similarly, if people are being referred to – or from – an external facility, eStar will enable the instantaneous sharing of files, test results, prescriptions, and any other relevant patient data, in a heartbeat. In addition, eStar will enable Vanderbilt to combine charges from multiple sources into a single document. This means, no matter how many different departments at Vanderbilt a patient has visited, they will only receive one, easy to understand bill. 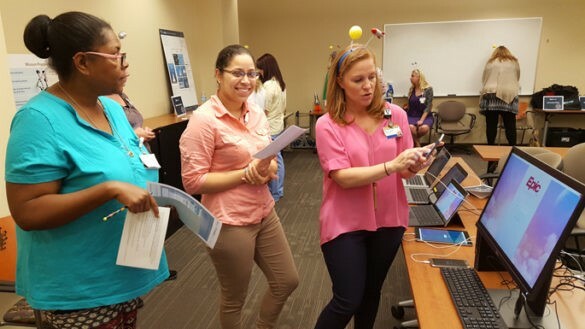 With the new system due to go live in November, and extensive training for Vanderbilt’s staff to be completed before that date, it’s all-hands-on-deck for the hospital. Once eStar has lifted-off and staff are using it in real-life situations for the first time, however, we can expect to see the entire patient experience take-off with it. The last word goes to C. Wright Pinson, MBA, M.D., Deputy CEO and Chief Health System Officer for VUMC. Hear Vanderbilt’s Brian Carlson, Director, Patient Access and Experience Associate, at Next Generation Patient Experience 2017 this November. Download the Next Generation Patient Experience 2017 Agenda to learn more.